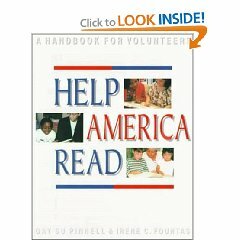 All of our volunteers read, study, and discuss the book Help America Read: A Handbook for Volunteers by Gay Su Pinnell and Irene Fountas. Training sessions are held monthly. Tutoring is not easy. It can be difficult establishing a relationship with a young scholar , especially if that youngster has had difficult relationships in the past. You may encounter challenges and this is normal. This is part of the reason we meet regularly as a team to offer each other guidance, suggestions, and support. – The training program will help you understand and apply each way effectively. – Chapter 2 provides an overview of each of the ten ways literacy volunteers can help children. It is essential to create a very simple structure for the hour you work with your child. A successful session will cover a number of different activities. Select a book and read 10 min. Talk with child about book 2 min. Listen to the child reread 8 min. Write a sentence together 5min. Read a book aloud to the child. 10 min. Have materials organized and ready before you start with the child. Include both reading and writing. Make sure the child is actively engaged. Keep a lively pace (don’t get stuck on one activity). Make sure the child is always successful (not struggling). Record notes about how the session went and list the points you want to remember for next time. Reorganize materials and make a brief outline for the next session. Create a risk free environment for learners. Students need to be interested and engaged. Students should have opportunities to make connections between what they know and new information. Know students’ interests and backgrounds. Value the students’ individual communities from which they come. Work for and expect surprises. Draw on students’ attention and help them attend. Provide multiple opportunities to learn and revisit the learning. Provide individual attention and tailored instruction for students. Work regularly with students in a one-on-one setting. Be able to change direction when it is necessary. Read students’ signals (when they are comfortable, uncomfortable, enjoying activities, etc.). Help students experience success. Praise students and look for their approximations (focus on ‘the half right’). Be positive and work from students’ strengths. Surround students with quality texts. Provide opportunities for social interaction through such activities as shared reading, buddy reading, interactive writing, choral reading, songs, poetry, and rewritten books. Find what works for the students and you. Listen hard and be set for diversity. Early in tutoring interactions, establishing rapport and getting to know the students as readers and writers is very important. Consider using the following interviews as part of gather information about readers and writers. Once tutors have established rapport and found out how to approach students based upon their interests, moving into instruction and support of their efforts to read and write will provide you with additional information from their reading and response to lessons. A simple “lesson record” form is also provided to allow you to make note of lesson activities and report on your observations. When you are reading and you come to something you don’t know, what do you do? Do you ever do anything else? What makes ________ a good reader? Do you think that _______ever comes to something s/he doesn’t know? (Yes) When ______ comes to something s/he doesn’t know, what do you think s/he does? (No) Suppose ______ comes to something sh/e diesn’t know, what would s/he do? If you know someone was having trouble reading, how would you help that person? What would a teacher do to help that person? Do you think you are a good reader? Why? Tell me the kinds of things you read. What kinds of things do you like to read at home? At school? Who reads to you? Who else reads to you? What is your favorite book that someone has read aloud to you? Who read it? What is your favorite book that you have read for yourself? What kinds of stories and books do you like to hear read aloud to you? What kinds of stories and books do you like to read for yourself? How much do you like to read? Very much? Quite a lot? Not very much? Not at all? What are some of the books that you have at home? What else do you read at home? Have you ever been to the library with a member of your family? Do you have a library card? How many books have you checked out of the library in the past month? Tell me the kinds of things you write. What kinds of things do you like to write at home? At school? Who writes to you? Who else writes to you? What is the best thing you have written? What kinds of stories would you like to write that you haven’t gotten to write yet? How much do you like to write? Very much? Quite a lot? Not very much? Not at all? What are some of the things do you have at home to write with? What kinds of things do you write at home? Do you write with your mom, or dad, or other members of your family?